At just 10.2mm thin, the compact new Walkman S-Series still manages to find room for two high-quality stereo speakers guarded by a tough, stylish aluminum speaker grille. Whatever your listening preference, the slimline Digital Linear Phase Speaker System delivers satisfying, sound with solid bass and crystal clear highs. Listening on speakers is enhanced by Digital Linear Phase Speaker System technologies unique to Sony. If you want to keep your music private, listening on supplied mediocre headphones is enhanced with unique Clear Audio technologies from Sony for a dynamic, detail-packed soundstage. Clear Stereo reduces leakage between left and right channels, while Clear Bass delivers powerful, controlled low-end frequencies without distortion. There’s a 5-band equalizer to color your audio to your preference. In addition, a Dynamic Normalizer balances volume levels between songs. The updated Walkman S-Series lets you keep listening for longer, with up to an incredible 42 hours listening time on headphones from a single charge. You can even listen for up to 17 hours through the built-in speakers. Battery life with video playback is a similarly impressive 6.5 hours: plenty to keep you entertained on that holiday flight or the daily commute to work (5 hours video when using built-in speakers). 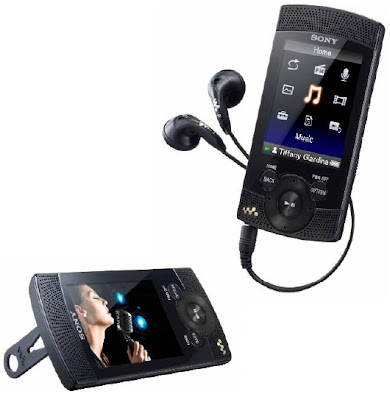 The new S-Series Walkman will be priced very competitively, most likely found cheaper than its main rival, the iPod Nano.